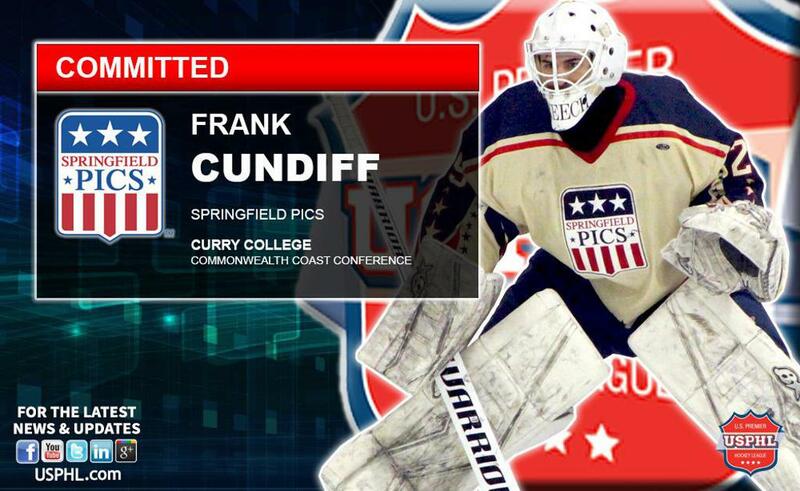 WEST SPRINGFIELD, Massachusetts—The Springfield Pics are proud to announce that goalkeeper Frank Cundiff has committed to Curry College for the fall. A mid-season acquisition, Cundiff made nine starts for Springfield, going 5-4-0 with a .901 SV% and 3.21 GAA. Curry, which competes in the Commonwealth Coast Conference, finished last season 14-10-2. Cundiff will join Lionel Mauron, another Pics alumnus, on the Colonels roster. “We would like to congratulate Frank and his family on this accomplishment. He joined us at the midpoint this season and gave us an opportunity to win each night he started,” said Pics head coach and general manager Patrick Tabb. “He won 5 straight games after joining us at a key point in time for our hockey club. I feel he will compete for the starting job as a freshman; he is a great teammate, loves to be at the rink and on the ice, even lending a helping hand coaching our 07' team,” Tabb noted.